Take in the city's rich history with this exclusive New Orleans Unlimited Sightseeing Package – includes three 45-minute Walking Tours and 3 Days of Hop-On Hop-Off FUN on the Open-Top Double-Deckers! This City Deal explores 3 centuries of history, architecture, and culture narrated live in English by your very own Tour Host. Stroll around the Famous St. Louis Cemetery #1, the Historic French Quarter and the Grand Garden District! WHAT’S INCLUDED? New Orleans’ most Popular Sightseeing Tours! 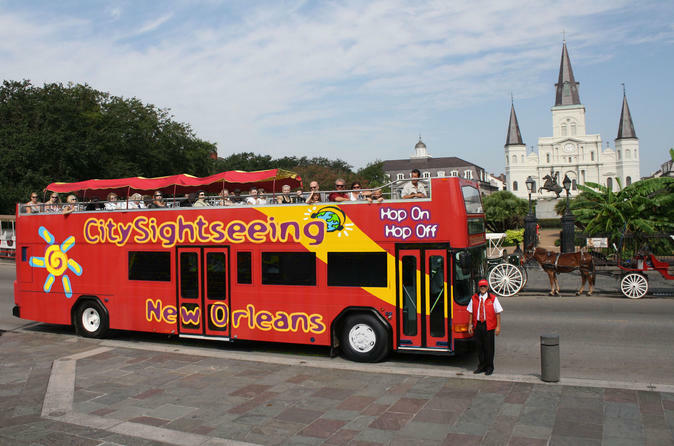 Hop-On Hop-Off 3-Day Ticket ($49 value) City Sightseeing New Orleans’ experience is the most informative and FUN City Tour travelers can find – Explore at your own pace with buses every 30 minutes or less. Discover 3 centuries of history, architecture, and culture narrated live in English by our licensed Tour Hosts. Tour Hosts offer engaging commentary and invite you to Hop-Off at your leisure to see the multiple attractions, restaurants and more along our 2-hour loop. Hop-On Any Bus at Any Stop Daily 9:30am – 5:30pm. First-Come First-Serve, No Reservations Required. Hop-On by 3:30pm to complete a full loop. Buses are ADA Accessible. St. Louis Cemetery No. 1 Walking Tour ($20 value) Explore New Orleans’ oldest cemetery and site of the famous tomb of Voodoo Priestess Marie Laveau! This escorted tour takes visitors through one of the great Cities of the Dead. Tombs and vaults stand tall in French and Spanish traditions. Elaborate family tombs, economic wall vaults and society mausoleums are all clustered throughout the meandering walkways and passages. Daily Departures from 501 Basin Street, near Stop 5, at 9:30am, 10:30am, 11:30am, 12:30pm, 1:30pm. First-Come First-Serve, No Reservations Required. Tours are 45 minutes and less than 1 mile. Garden District Walking Tour ($25 value) Explore the splendor and elegance of the Garden District - one of New Orleans’ most sophisticated, historic and elegant neighborhoods! Walk with one of City Sightseeing’s experienced, licensed, local tour guides, through tree-lined streets radiating with grace and opulence. Learn about Greek Revival, Italianate and other architectural styles that characterize the area - visit celebrity homes along the way! Daily Departures from Hop-On Hop-Off Stop 11 at 2135 Magazine Street at 11am, 12pm, 1pm, 2pm, 3pm. First-Come First-Serve, No Reservations Required. Tours are 45 minutes and less than 1 mile. French Quarter Walking Tour ($25 value) Stroll the historic French Quarter with an experienced, locally licensed City Sightseeing tour guide. Marvel at the history and architecture of America’s most fascinating neighborhood – Includes Jackson Square, the St. Louis Cathedral, Pirates Alley and a visit to the most classic French Quarter Courtyard. Daily Departures from the Hop-On Hop-Off Ticket Office, 700 Decatur Street, near Stop 1, at 11am, 12pm, 1pm, 2pm, 3pm. First-Come First-Serve, No Reservations Required. Tours are 45 minutes and less than 1 mile. Lafayette Cemetery No. 1 Walking Tour - This is a self-guided tour, using the City Sightseeing map and descriptive pamphlet, which takes the visitor through one of the great Cities Of the Dead. Open Daily 7am – 3pm and Closed on Holidays. 13 Minute Walk from Hop-On Hop-Off Stop 15. SEE MORE & SAVE MORE with this affordable, flexible New Orleans Sightseeing Package!